Fossils often provide us with only a fragmentary view of the distant past but sometimes collections of fossils record ancient and seemingly alien worlds in stunning clarity. 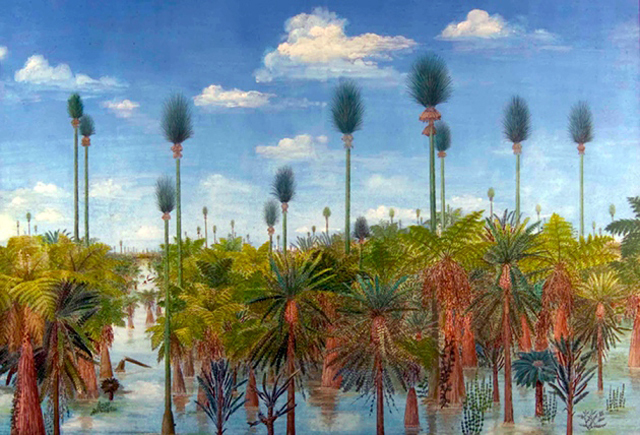 In the past decade several notable fossil discoveries have permitted the reconstruction of entire forest ecosystems that existed at various points in time and space in earth history. Today, I share with you a fossil forest from China. It is a forest completely devoid of the presence of any flowering plants–the dominant plants on earth today–such as oaks, maples and beech trees or even conifers such as firs, hemlocks or cedars. A forest populated by dragonflies and amphibians but curiously lacking any birds, mammals or bees. The contrast between the interpretations of conventional geology and young-earth flood geology understanding of the origins of these fossil forests could not be more striking than in the case of this “Permian Pompeii” fossilized forests found in China. The former interprets the forest as a real community of plants growing in space and time that was preserved intact by a volcanic ash from a local volcanic eruption, while the latter imagines these plants, and the coal seams they are found sandwiched between, as collections of plant and animals material caught up in the middle of a global flood that laid them down to form layers of rock including the coal and ash layers over a short–days to weeks–period of time. Look at the picture above. When I saw this reconstructed forest from the fossil record and I read a highlight of recently published research describing it I asked myself, how might the average evangelical Christian who has been brought up in a church culture espousing young earth creationism as the scientific response to secular science think when they read stories and see pictures such as the picture above? First, I expect that many Christians who encounter this fossil evidence or similar evidence such as those I have presented in the past (eg. fossilized elephant footprints or meteorite craters) will not even realize that these fossils raise very difficult challenges to their young earth worldview. Second, many Christians are unaware, and likely will never will become aware, of the fossil evidence such as these massive preserved forests and if they do it will be in the form of news highlights that have passed through the filter of young earth magazines. A third group of Christians will recognize the “danger” of these stories but assume that the reports are in error due to the bias of the investigators and so no further thought will be given to the apparent conflict between the data and their young earth view. If you are predisposed to a young-earth worldview and you make it to the bottom of this page then you certainly cannot be counted in the first two categories above. However, you should be warned that contemplation of the evidence presented below could make you uncomfortable as it will challenge your preconceived notions about the explanatory power of global flood geology. I have read the original research paper which the above quote sumarizes and several related research papers that describe the details of the geology and fossils at this site. Let me share a few more fact and inferences made from those facts before exploring how young-earth creationists might respond. 1) The fossilized forest referred to above was found preserved in a 66 cm layer of tephra (volcanic ash) which is characteristically deposited as air-born ash fall. The original ash fall was probably at least 100 cm (about 3 feet) but was compacted by material that eventually accumulated above the ash. From other studies we know that volcanic ash has exceptional capacity to preserve objects. The scientists methodically broke up about 1000 square meters of this preserved ash layer and with great effort counted, measured and recorded every plant fossil found in it along with the exact location. 2) The ash layer is found between two thick layers of coal (the reason that the Chinese were digging in this area to begin with and exposed this fascinating ash layer). The figure to the right shows the stratigraphic profile showing the position and thickness of the coal layers and presence of multiple fossil flora found this an other ash layers. 3) The ash layer contains the remains of entire plants, most of them in presumably the exact positions they were in when the ash fell on them. Leaves and branches would have fallen to the ground in the forest. Tree trunks are preserved lying horizontally in the ash but the bases of the trees are preserved rooted at the coal seam below. 4) Representatives of six types of plants were identified from examination of thousands of samples. There are multiple species of some groups (eg. several species of tree ferns) but the overall diversity of plants is very low compared to typical plant communities alive today. 5) Other than the tree ferns, the types of plants identified are very different from any plants alive today! This is the feature that should be most striking, and possibly disturbing, to anyone that looks at the reconstruction pictures (see above and below). Even the tree-ferns which have some similarities to those found in the tropics today are definitely not the same species or even same genera as those alive today. Similarly there a few types of cycads which are simple form of conifer and have similar living “relatives’ today. Most plants in this forest are members of groups of plants (eg. 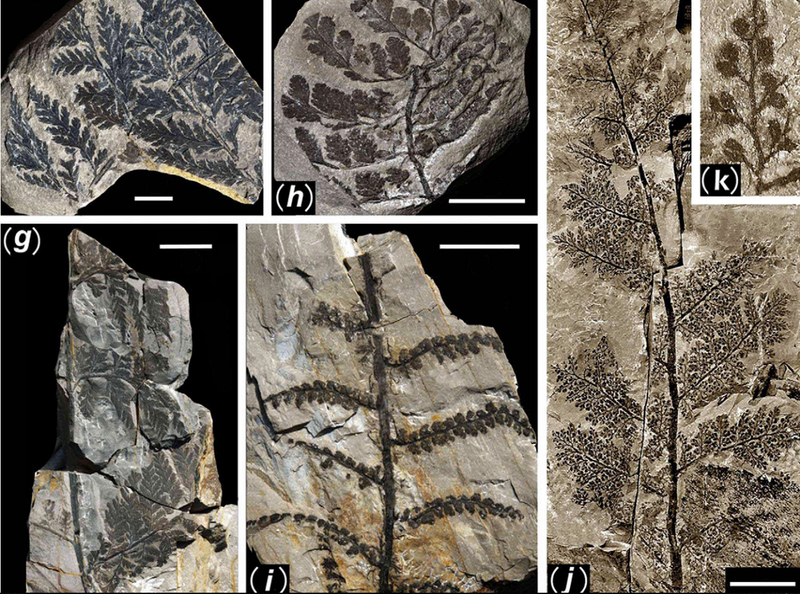 Seed ferns and lycopods) that are ONLY found in the fossil record and typically are only found in very deep/old layers of the fossil record. 6) Animals are also found well preserved in these ash layers. A large ash fall would have been expected to kill any animals living in the forest canopy or forest floor at the time. The animals found are a collection of amphibians and “primitive” insects such as dragonflies. No bees, no reptiles, no mammals and no birds have been found in this forest nor any other forest of similar age. 7) Related to #5 above but deserving its own point: There were no flowering plants identified in this forest. There were also no pines, no cyprus, or spruce trees. There are no cattails and no aquatic flowering plants such as water lilies. There isn’t even any pollen of flowering plants present and pollen today is the most easily preserved part of a plant especially in volcanic ash so we can quite reasonably conclude that there were no flowering plants here or even in the area around this site when this ash was deposited. Simply put, the forest that is preserved in this volcanic ash is like no other forest anywhere on earth today! Look at the two reconstructions of the forest plants. These trees are strange to us today but the trees in this forest were already well known from the fossil record. They had already been described from many other locations and there is a high degree of confidence in the general appearance of these trees, especially the very tall (>40 feet) trees with the fuzzy tops. Below is a picture of just a few of the thousands of fossils extracted from this site. The detail of the leaves is stunning allowing for species identifications in many cases. 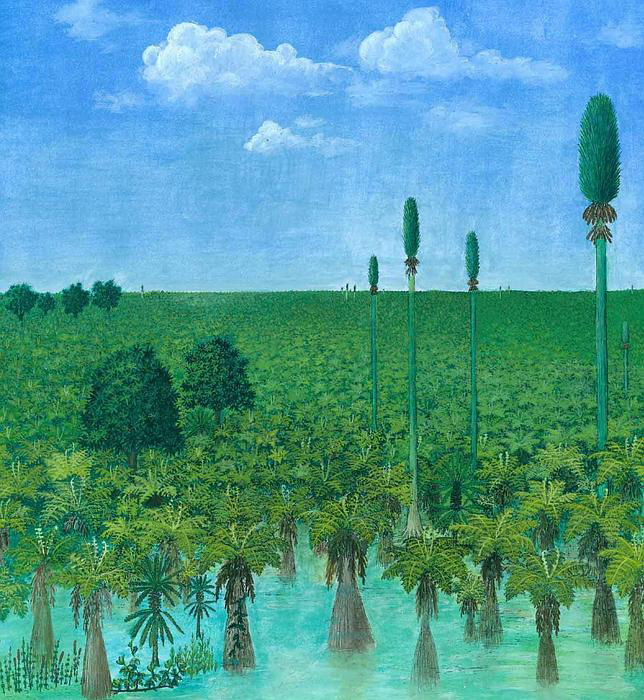 You might ask, but couldn’t this forest just represent an isolated pocket of strange plants that were preserved? No, because the same groups of odd plants have been described in fossilized forests captured in volcanic ash or sediments above coal seams on nearly every continent. Similar extensive studies that have described every single preserved tree over acres of land have been conducted in eastern Europe, Canada and in Illinois, Pennsylvania and Indiana. These all have demonstrated the presence of similar groups of plants in a community to the exclusion of any flowering plants and they have been found in rocks dated to similar ages (250 to 300 million years) as those in China. 1) What might be the specific series of events that could lead to such an odd collection of plants being preserved globally in the same “aged” rock at multiple locations all around the world? 2) How might a 66 cm layer of volcanic ash be deposited between two layers of compressed plants (coal) in the middle of a violent world-wide flood? 3) Why are there no apparent flowering plants, no reptiles, no mammals and no birds preserved in rock that preserves vast quantities of highly detailed plants in life-like habit? 4) If all coal from the so-called Carboniferous period, which accounts for a large portion of all coal on earth, is composed solely of these types of plants (i.e., ferns and lycopods and NO flowering plants), shouldn’t that affect how young earth creationists thinks about what the pre-Flood world looked like? Figure 2 from Wang et al. PNAS 2012 (see reference citation below). This is the spatial data for the peat-forming swamp forest buried in vocanic ash. The types of trees are color coding allowing visualization of the spatial distribution of plants. Notice that the three sites each had different patterns of plants. B is the reconstruction of what the trees may have looked like along with their spatial patterning. This is an revised and updated version of an article posted in April of 2012. In situations like this, rather than try to specifically explain the formation via a global flood, I think YEC’s are more likely to fall back on the dichotomy – simply try to poke holes at the details of the old-earth explanation and declare it refuted, while claiming that they may not yet be able to explain everything via a global flood but maybe one day they will. He has many more descriptions of the “difficulties” and “absurd” conclusions of conventional geology. And, of course, there’s the everlasting favorite examples where “a fossil tree is found extending up through two or more of these successive beds of coal, together with the intervening beds of shale or sandstone”. I really don’t understand why you even believe in God. The arguments you use against yec are equally capable of being launched against your whole system. You attack YEC without putting forward a significant positive argument/worldview in your blog. “Evolution is true and YEC is very, very wrong” isn’t a comprehensive or particularly convincing worldview that has a god in it. Or do you really not care about the god part? Hi, Stephen. Can you be more specific – what arguments do you find to be illogical or counter-factual? If you have any sources for an alternative explanation for this scenario, that would be really helpful. I’m also not clear on how this example argues for or against a belief in God. If you read further back into Joel’s articles, you can find much more detailed discussions of his faith and his worldview. There’s plenty to agree or disagree with, but I haven’t been led to wonder “[does he] really not care about the god part.” If you could offer some quotations of this article gives you that impression, perhaps I could understand you better. Thanks! Thank you, Mel. I was taken aback by Stephen’s comments but was dumfounded as to how thoughtfully, graciously, helpfully, to reply. Thank you for expressing what I could not. And thank you John, for expressing my own thoughts.